Reading development is seen as a partnership between home and school and children are encouraged to choose books to take home to read to their parents. At St Oswald’s reading books are changed on a daily basis but only if the children have finished their book. Parents are fully supportive of this and communicate with school by making a short comment about their child’s progress in their reading record. If children do not read at home every evening then they are heard to read at school. From introducing this process the children have become more enthusiastic about their reading and are excited about what they are going to be reading next. The children experience a wide variety of reading material at appropriate levels of complexity and interest so that they become competent, enthusiastic and fluent readers. 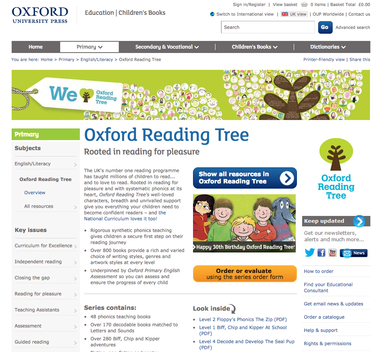 Here at St Oswald’s we use the Oxford Reading Tree scheme, this was developed in conjunction with literacy experts Debbie Hepplewhite, who was the creator of the synthetic phonics programme used in schools. Oxford Reading Tree has synthetic phonics at its heart, so teachers can deliver systematic phonics teaching with all the children’s favourite characters. It is perfect for supporting individual reading as well as group and whole-class work. It is divided into stages which are colour coded and book-banded for ease-of-use. This scheme begins in the Foundation Stage and progressively become more difficult. Key Stage 1 books are written with a mix of high-frequency and decodable words to develop a range of reading strategies. While in Key Stage 2 the books cover a wide range of genres and subjects, linking to the curriculum. Biff, Chip and Kipper stories have taught millions of children to read and remain tried and tested, loved and trusted in over 80% of UK primary schools. Aside from the much-loved characters these delightful stories have fun, familiar settings which children can really relate to and are packed full of humour enjoyed by teachers, parents and children alike. We use Oxford University Press Project X for our Guided Reading sessions. In March 2017 we introduced a reading buddies system in school. For half an hour per week classes pair up and read to each other. This is very popular with the children and they all thoroughly enjoy the sessions.